I watch that film I Like this film. Ajay Devgan is the best actor in Bollywood. He play a mind blowing character in this film as sultan salim mirza. devgn is one of the finest actors in the entire film industry, whether its an acton oriented, drama oriented or a comedy he is there to deliver his best. It is real love story which is turned into a film named as Once Upon Time In Mumbai. Garonris, You said very well. It is really very good movie. I watch this movie many time But Still have a good image in my heart and No such movie can replace it.. It is awesome and Blockbuster movie. It is fully thrill movie. Have very good story and based on real life. I see this movie in theatre. Its very good screened... It is one of my favorite movie. The songs of this movie are awesome. I listened all the songs. My favorite is 'tum jo aye jindgi me baat ban gyi'. Lyrics is awesome. It never compete with another. This is outstanding movie. Its imaging story. I have seen this movie lots of time. But every time it retains its value in my heart. 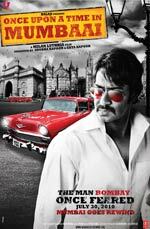 Ajay Devgan Give their best performance ever. I like him too much.